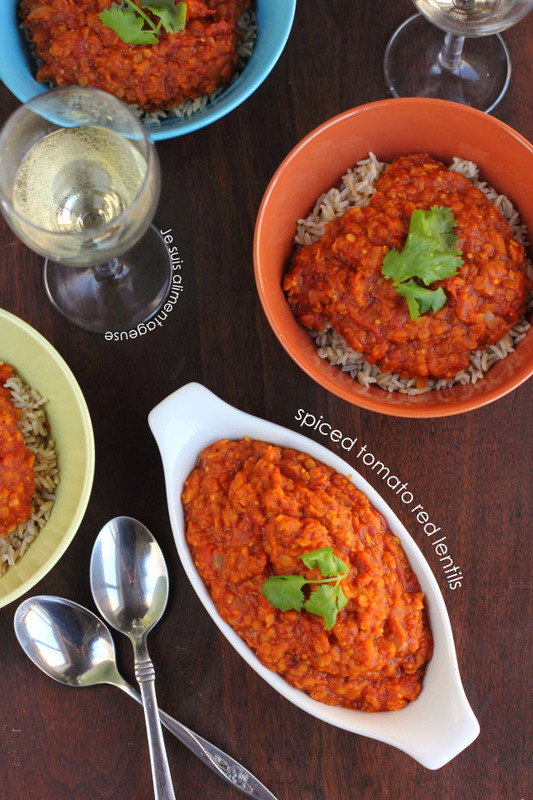 Spiced tomato red lentils are filling, easy on the wallet, and so good! I hope everyone enjoyed the long weekend and had lots of time to enjoy the beautiful weekend with friends and family. I had a friend visit from out of town and I hosted a taste-testing early dinner shebang to see what my friends thought of this lentil dish. I made it earlier last weekÂ but I made a couple changes and did a little cooking on the fly so I wanted to retest the recipe for consistency and double check that people liked it. 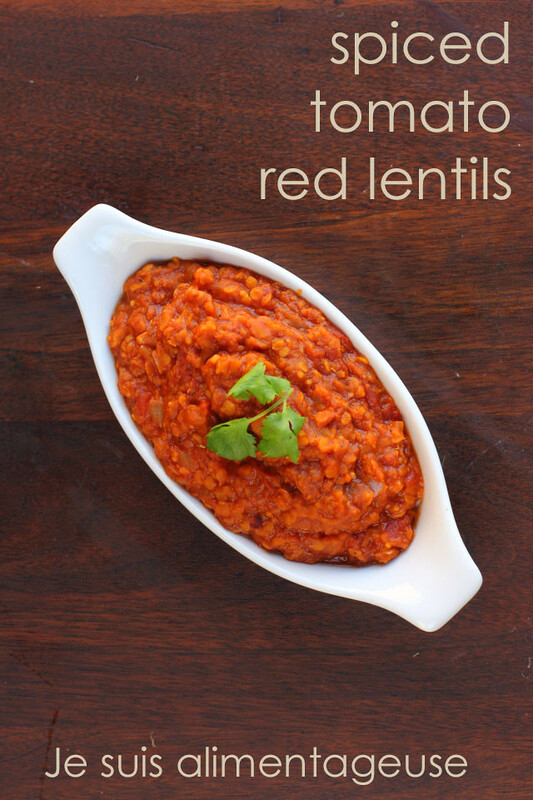 These lentils had a beautiful tomato flavour with hearty lentils to add depth, texture, and substance to this. 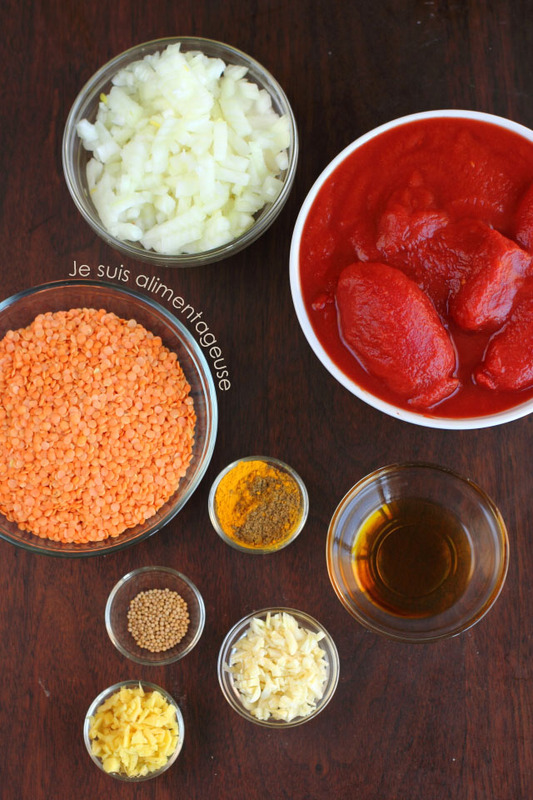 The last step of blooming the spices is very important (according to the original recipe) because it activates the spices and will envelope these lentils in a warm, spiced hug of flavour. It was very filling and the entire meal for 4 of us (two of us had some seconds as well) probably only cost me about $10, so about $2.50 per person! With my student loan payments looming and my student-life no longer being a reality, I’m even more aware that I need to penny pinch and start saving. My friends started asking me if I had an RRSP or a Tax-Free Savings account. No and yes, respectively (although it’s um…empty). Although suddenly felt like a very irresponsible 23-year-old because my friends had these savings and I didn’t. I mean, I used to have those savings until I started my MA. And then I moved to Toronto. And then bought my 60D… And a ticket to BlogHer Food. Okay, I admit. Not the best at saving. I’m working on it. As soon as my credit card debt isn’t the monstrosity it is right now (granted I’m at a WAY better place than I was a month ago), I’m going to start being a responsible adult and put 10% of my income away. I bet my mom is reading this right now and kind of laughing and nodding. Yeah, right,Â she thinks. Srsly Mom. Life goal right here. Need to start saving for real life. Like a dog. Or a house. Although my main priority is still focused on rent. In the meantime, I’ll continue being a promo girl, food blogger, and doing freelance web work on the side. In a large pot, dry stir fry onion over medium heat, stirring constantly. Once translucent, add garlic, ginger, and serrano chile if using, and cook until fragrant. To bloom the spices, in another pot, heat toasted sesame oil and olive oil over medium heat. Add the mustard and stir until fragrant (about 30 seconds). Add the cumin and turmeric and continue to stir until foamy. Pour oil and spice mixture into lentil pot and stir to blend. Add salt and pepper, adjust spices to taste. Serve over brown basmati rice with some fresh chopped cilantro on top!